All the canned replies were in Japanese. OK, my wife and I both speak some Japanese but not so much we message each other in it. What the nabeyaki udon? The weird thing was, it was only for her. All my other replies to Messages sessions were in English. 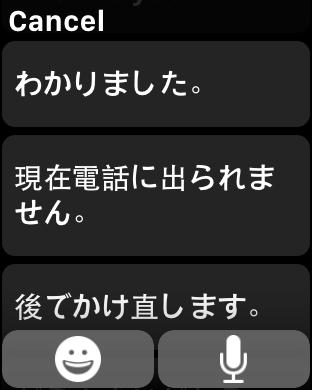 I’m sure bilingual Watch owners probably already know this but it took me a little while to figure it out. If you have a foreign keyboard up in a Messages reply on the iPhone, it forces canned Watch responses to that language. I have the Japanese keyboard enabled on my iPhone because I sometimes use it. What had happened was that I went to respond to my wife on my iPhone, had thought about using an emoji and started cycling through the keyboards but decided to go talk to her instead so I stopped at the Japanese one and left it there. Obviously, this is done so the Watch responses are in the same language you use to message someone on the iPhone, which makes sense. And it works if the keyboard is showing on the iPhone or hidden. It’s just a little surprising if it kicks in by mistake. It only works for languages that are enabled on the Apple Watch, so Russian works but Hebrew doesn’t, you just get English (or whatever your default language is set to). And it’s only a language thing, so it only changes the canned Watch responses. It doesn’t do anything if you put up the emoji keyboard on your iPhone.